Bernstein met JFK in the 1950s and regularly attended event at the Kennedy White House. Frank Sinatra was asked to produce a gala on the eve of the Inauguration on January 19, 1961, at the National Guard Armory, Washington, D.C. Selected to conduct the seventy-piece band, Bernstein began the gala with his newly composed Fanfare. Despite a terrible blizzard and a delayed start, the star-studded line-up, including Ethel Merman, Nat "King" Cole, Sir Laurence Olivier, Sidney Poitier, Harry Belafonte, Ella Fitzgerald and many others, managed to entertain to the delight of the President and First Lady-elect. To perform Fanfare, contact Boosey & Hawkes. For general licensing inquiries, click here. 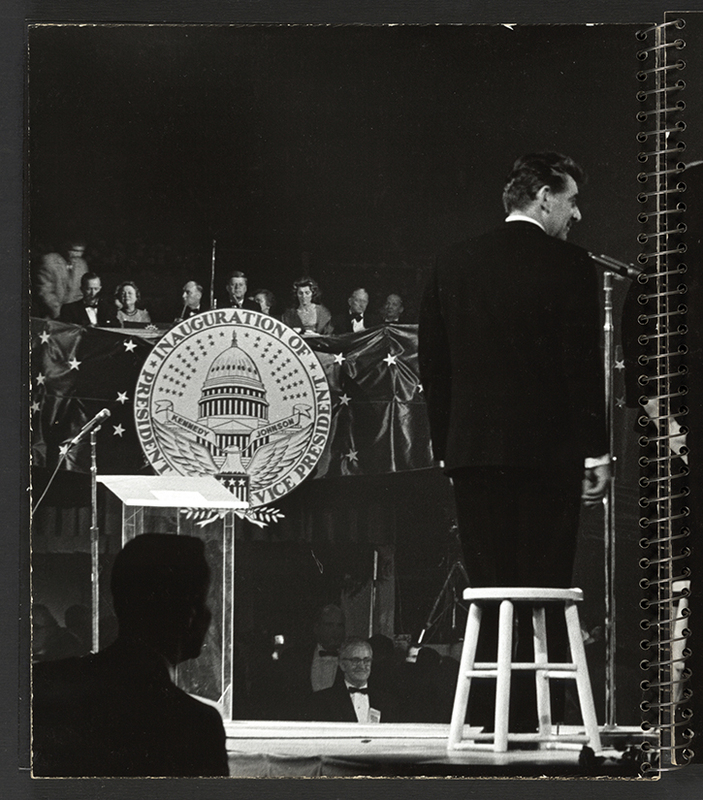 Leonard Bernstein conducting at President-elect John F. Kennedy’s inauguration-eve gala, with Kennedy in background. National Guard Armory, Washington, D.C. January 19, 1961. Gianandrea Noseda and the National Symphony Orchestra perform Leonard Bernstein's "Fanfare for the Inauguration of JFK."